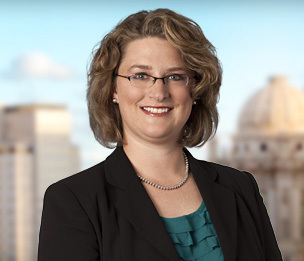 Heather L. Kramer’s trial and litigation experience has been diverse and extensive. Throughout her career, she has represented businesses and individuals in disputes arising from fraud, breach of contract, privacy and consumer statutory violations (i.e., FDCPA, TCPA, BIPA, etc. ), personal injury, premises liability, theft of trade secrets, trademark infringement, fraudulent conveyances, copyright infringement, breaches of fiduciary duty, and product liability. One significant area of Ms. Kramer’s practice is handling complex individual and class action litigation in the area of privacy and consumer financial services and fair debt collection practices. She has also defended individuals and businesses, directly or through retention by an insurance carrier, in a variety of personal injury litigation. She has tried cases before both juries and judges involving fraud, trademark infringement, covenants not to compete, and breaches of all types of commercial contracts. In addition to her trial experience, Ms. Kramer has successfully resolved matters through settlement or during the summary judgment or motion to dismiss stages. To better serve clients, Ms. Kramer is a member of Dykema’s Illinois Biometric Privacy Act (“BIPA”) Litigation and Response Team at Dykema, which is prepared to assist clients with lawsuits and any pre-lawsuit consulting needs to defend against and avoid BIPA claims. Grant Hospital v. Blue Cross of Illinois (October 2011). Obtained million dollar judgment, exclusive of interest and attorney fees, on behalf of Grant Hospital and more than 200 of its creditors, against Blue Cross and Blue Shield of Illinois, after a nine-day trial arising from an accounting and contract dispute under various provider agreements issued to several successive owners of the hospital. Farberware Licensing Co. v. Meyer Corporation, et al., Case No. 09-CV-2570 (2009 SDNY). Successfully represented a cookware manufacturer in a breach of licensing and trademark infringement matter and obtained a jury verdict in its favor. Appelbaum v. Appelbaum, 355 Ill.App.3d 926, 823 N.E.2d (1st Dist. 2005). Reversing issuance of preliminary injunction based upon post-employment covenant not to compete; court found that employer had no protectable interest in its relationship with customers. Represented insured in a premises liability matter, involving the purported wrongful death of a person who fell down an elevator shaft. Represented financial service companies in individual and class actions lawsuits against claims asserting violations of various consumer statutes, including the FDCPA, TCPA, ICAA, and ICFA. Represented drug manufacturer in both consumer class actions and individual personal injury actions involving claims of common law fraud, consumer fraud, negligence, and strict product liability. Represented buyer of landmark Chicago office building in a two-week jury trial involving breach of contract and fraud claims, which was successfully resolved prior to closing arguments. Represented former owner and employees of insurance agency in five-week bench trial against new owner of agency, involving issues of breach of contract and enforceability of covenants not to compete. Represented a manufacturer of coffee-making products in a patent infringement dispute and drafted successful motions in limine that barred large portions of defendant’s exhibits and expert report. Represented a real estate construction and development company in a breach of contract and fraud dispute with one of its vendors, which resulted in a favorable settlement. Represented trading firm of the Chicago Board of Trade (CBOT) in its objection to and appeal of a class action settlement arising from the CBOT’s landmark litigation with the Chicago Board Options Exchange (CBOE) over the equity and trading rights of CBOT members at CBOE upon CBOE's anticipated demutualization. Represented retail jewelry business in a consumer class action matter involving violations of the Fair Credit Reporting Act. Represented a health benefit association in a consumer fraud/unfair business practices action brought by the Attorney General of the State of Illinois. Mediated a resolution to the satisfaction of all parties. Represented drug manufacturer in both consumer class actions and individual actions involving claims of common law fraud, consumer fraud, negligence, and strict product liability. Conducted internal investigation of Fortune 100 company (in English and Spanish). Defeated State’s attempts to terminate parental rights of a Mexican citizen. Represented asylees from Ethiopia and Guatemala. "Arbitration Clauses & BIPA: The Broader the Better"
"Business Litigation and Fiduciary Duties - What Partners Should Know About Settlement Agreements"